Padrino is a web framework, closely related to its cousin, the Sinatra web framework. It tries to offer the flexibility of development of Sinatra and a wide array of helpers, tools and add-ons of Rails. Padrino, Italian for “godfather”, is built on top of Sinatra, so you can use all your knowledge gained from the previous Sinatra series published on this site. However, it is somewhat different, as it provides some conventions that look very similar to the ones found in the previously mentioned articles, as you will see. By the way, I will use Ruby 1.9.2 for this tutorial. This creates a project named rubytoday. Now that we have the initial bare app, it’s a good time to check it into Git. That way, you can revert to this state again should the need arise. Before we do that, open the .gitignore file and add a regular expression pattern of the backup files that your editor creates. In my case that’s Emacs and the backup files have an ending of: *~. The last command git status states that I’m currently on the main master branch. To do further work, I will create a new branch and do my work within it. Once I’m happy with it, I’ll merge it back into the master branch. With the command git checkout -b helloworld I created a new branch helloworld and switched to it. The initial ‘*’ in front of the branch name states the branch in which I’m currently working. If the branch name is anything to go by, you probably guessed what the next part of the tutorial will show. The creation of the “Hello world” page. Since this tutorial tries to teach the usage of Cucumber and Behaviour Driven Development, I’ll start by writing a feature file explaining how I wish my application to behave. Feature and Scenario are keywords. Feature is the main title, as it were, that briefly outlines what is being described, followed by a description. Scenario is an example of how a particular example should manifest. Which is understandable, as I haven’t created anything that can render such greeting. which in turn creates events.rb under app/controllers and events_controller_spec.rb under spec/app/controllers/. which coincidentally is exactly what I’m trying to describe. Which confirms that I have set up the default root path to Events controller’s index method. 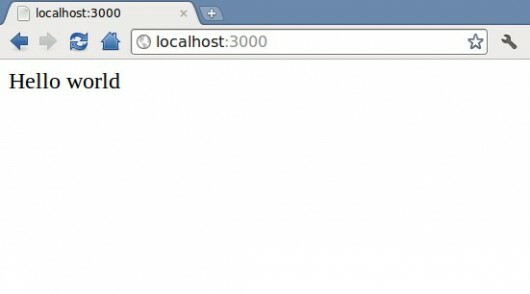 Failure/Error: last_response.body.should == "Hello World"
and opening the URL in the browser: http://0.0.0.0:3000. First I wrote the feature and described the behaviour, then I wrote the example in RSpec and finally I implemented the code to fit both the feature and the example. This lists all the new content that needs to be committed to Git along with the deleted content: features/add.feature file, which I removed earlier. $ git commit -m "Implemented the 'Hello world' example"
This concludes the first tutorial in the series. In the next tutorial I will show how to merge content in Git, how to deploy it to Heroku and I’ll carry on building the rest of the app. If this is your first look at Padrino, I’d love to hear what you think in the comments below. All the code can be obtained from here: https://github.com/RubySource/simic_padrino. Laughing cowboy punching ignorance in the face (that was stolen from my Twitter stream) aka Aleksandar Simic, tweets as @dotemacs.